Missouri Gov. Jay Nixon has appointed Judge Paula Bryant, who teaches as an adjunct in the Legal Studies Department, to be circuit judge for the 22nd Judicial Circuit, which covers St. Louis. Judge Bryant has taught Legal Studies at Webster University for over 10 years. She teaches Introduction to law, Criminal Litigation and Criminal Evidence. As reported in the St. Louis Post-Dispatch, she will fill a vacancy created by the retirement of the Margaret Neill. Bryant has served on the associate circuit court since 2004 and has presided over both civil and criminal cases. Commentary on Cuba’s recent party congress by Daniel Hellinger, professor in History, Politics and International Relations of the College of Arts & Sciences, is featured in the InterAmerican Dialogue’s Latin American Advisor (June 14). He also recently lectured and was interviewed on the reform process in Cuba at the Central European University in Budapest, and he lectured on the subject at Webster University’s Athens campus. “I have no confidence in the opposition, let me tell you. But I also don’t have a lot of confidence in the government. So where does that leave me as an observer of Venezuela politics? Very pessimistic.” Hellinger said. 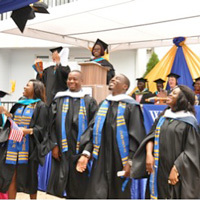 Coverage and photos of the second commencement at the Ghana campus, with comments from playwright James Ebo Whyte and campus director Christa Sanders, appeared in the Ghana news portal Joy Online.